(CNN) -- A Sudanese journalist could receive 40 lashings after she was caught wearing trousers. Lubna al-Hussein was arrested with 18 other women this month for wearing indecent clothes. 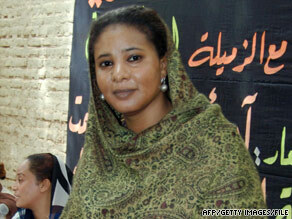 A Sudanese court began hearing Lubna al-Hussein's case Wednesday. It will continue the hearing August 4. Al-Hussein, who works for a newspaper and the media department of the United Nations mission in Sudan, said she did nothing wrong. She has been released to her home in Khartoum. "This case is the official retaliation against the reporter for her writings criticizing the Sudanese regime and extremists," the organization said in a statement. Al-Hussein was arrested along with 18 others July 3 after Sudan's "discipline police" accused the women of wearing indecent clothes, al-Hussein said. Six were released, and 10 received the 40 lashes, she said. U.N. Secretary-General Ban Ki-moon spoke out against the decision Wednesday, saying he was "deeply concerned" and would take every effort to protect his staff member. "The flogging is against the international human rights standards," he said. "I call on all parties to live up to their obligations under all relevant international instruments." CNN's Umaro Djau, Talia Kayali and Tracy Doueiry contributed to this report.